Atelier Caito for Herve Pierre dress in wool crepe. V neckline with scarf detail. Contrast belt at waist; bows at front. Model's measurements: Height 5'9" / 175cm, bust 32" / 81cm, waist 23" / 58cm, hips 34.5" / 88cm, dress size US 0/2. 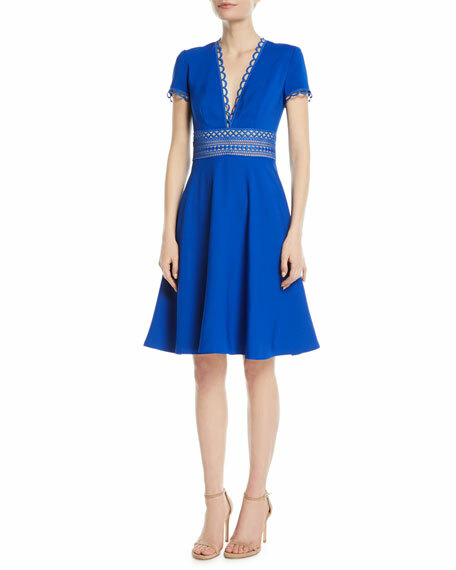 Badgley Mischka Collection dress in faille. Funnel neckline. Three-quarter bell sleeves. Sheath silhouette. Back princess seams. Hidden back zip. Vented at back. Knee-length hem. Polyester/spandex. Polyester lining. Dry clean. Imported. 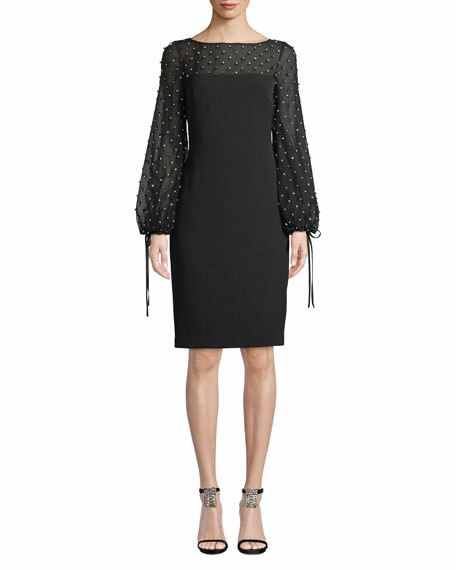 Badgley Mischka Collection cocktail dress with crystal beading at sheer yoke and sleeves. Bateau neckline; keyhole-button back. Long, balloon sleeves; tie cuffs. Hidden back zip. Knee length. Sheath silhouette. Polyester/spandex. Imported. Exclusively ours. 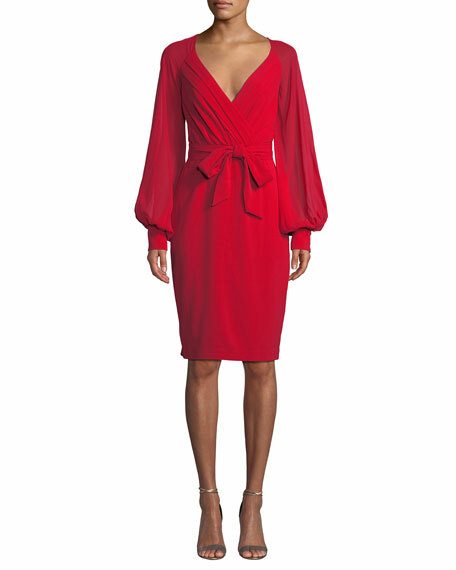 Badgley Mischka Collection faux-wrap dress. Surplice V neckline. Long blouson sleeves; cuffed. Self-tie sash at waist. Sheath silhouette. Knee-length. Straight hem; vented back. Hidden back zip. Polyester/spandex Imported.